Porsche is introducing its first plug-in hybrid and two new extended wheelbase variants with the second generation of the Panamera. The new Panamera S E-Hybrid produces 416 total system horsepower and is joined by Panamera 4S Executive and Panamera Turbo Executive models in the revised Panamera lineup. Further, S models are now powered by an entirely new 3.0-liter V6 engine with twin turbochargers. The broadest model range in its class has been further expanded, now consisting of nine models for the U.S. market. New and further-developed technologies offer improved performance while also enhancing fuel efficiency and comfort. The new Panamera is characterized by tighter lines, more pronounced contours and newly shaped body elements. The refreshed Panamera celebrates its world debut at Auto China in Shanghai, which opens on April 21, where further details on the new models will be revealed. Panamera S E-Hybrid sets new standards in performance, efficiency, and convenience in everyday use. The new Panamera S E-Hybrid improves upon the concept offered by the previous Panamera S Hybrid with a more powerful electric motor, a higher-performance battery that supplies more energy and is able be recharged from home or public vehicle charging stations. The electric drive produces 95 hp, more than double the power of the previous model's electric motor (47 hp). Electricity is stored in a newly developed lithium-ion battery, which at 9.4 kWh has increased capacity over the previous battery (1.7 kWh). Via the integrated on-board charging componentry and the standard Porsche Universal Charger (AC), the battery can reach full charge within approximately two and a half hours when connected to a 240V power source. The Panamera S E-Hybrid expands upon the driving performance of the previous generation, while fuel consumption is reduced when compared to the previous Panamera S Hybrid. Final U.S. EPA fuel economy ratings will be available closer to launch. Simultaneously, its electric-only driving performance is substantially improved, enhancing acceleration, range, and top speed. Electric-only driving is possible without any fuel consumption or local emissions, which is especially advantageous in city driving. The electric driving range of the Panamera S E-Hybrid is estimated to be greater than 20 miles based upon current NEDC testing. Driving range may vary in real world operation, due to the effects of environmental conditions, terrain, air conditioning and heating use, driving style and other factors. 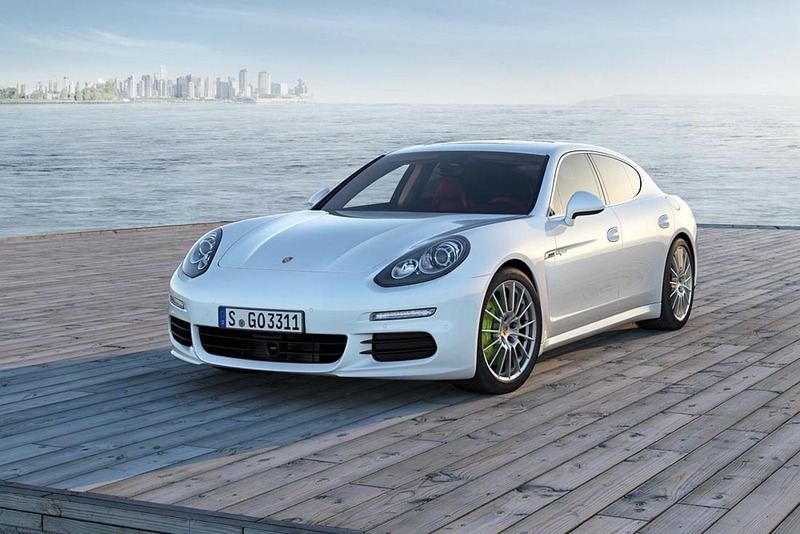 The Panamera S E-Hybrid can reach up to 84 mph in all-electric operation. The Panamera S E-hybrid is capable of accelerating from a standstill to 60 mph in 5.2 seconds, an improvement of a half second when compared to the Panamera S Hybrid. An electric boost function helps in instances where maximum acceleration is desired, when the electric motor works in tandem with the combustion engine during acceleration. Electric boost is also available when a kick-down switch in the throttle pedal is activated by the driver during acceleration. The car's top track speed is 167 mph. The parallel full hybrid system developed by Porsche also offers "coasting" at higher speeds, a mode wherein the internal combustion engine is turned off and the electric motors use vehicle momentum to generate electricity that is stored in the lithium-ion battery. The Panamera S E-Hybrid also includes an entirely new range of convenience functions which can be activated and operated by Porsche Car Connect, a mobile app available for Android and iOS-powered devices. These functions include a charge status indicator and the ability to control the vehicle's new auxiliary climate control option, which enables vehicle preheating or cooling via the Porsche Car Connect app. These functions can also be programmed from inside the vehicle. A mobile device may also be used for remote access to vehicle information, such as remaining driving range or vehicle location. Other functions not specific to the hybrid drive will also be available as options for other Panamera models via the Porsche Car Connect mobile app. The two full-sized rear bucket seats offered in the Panamera have proven so successful that Porsche is expanding this generous rear passenger compartment room with two new Panamera Executive models. The new Panamera 4S Executive and Panamera Turbo Executive models feature a wheelbase extended by 5.9 inches, enabling even more rear seating comfort and come with an extensive range of standard features. For example, all Executive models are equipped with Adaptive air-suspension featuring Porsche Active Suspension Management (PASM), which combines superior performance and enhanced ride comfort. Increasing both performance and efficiency has long been a core Porsche philosophy. In the new Panamera, this approach takes form in a 3.0-liter V6 engine with twin turbochargers. The twin-turbo V6 replaces the naturally aspirated 4.8-liter V8 engine in the previous-generation Panamera S and Panamera 4S. 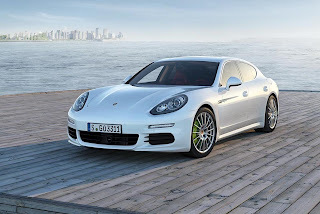 The new bi-turbo engine is also used in the Executive version of the Panamera 4S. The engine's figures themselves are indicators of progress: increases of 20 hp and 15 lb-ft torque when compared to the outgoing V8 engine. Carefully-managed turbocharging ensures that the maximum 384 lb-ft torque is available across most of the twin-turbo V6's operating range. With the exception of the Panamera S E-Hybrid, all Panamera models are equipped with the seven-speed Porsche Doppelkupplungsgetriebe (PDK); the Panamera S E-Hybrid uses the eight-speed Tiptronic S automatic. The PDK transmission works in tandem with other vehicle systems to enhance fuel savings in the new generation Panamera. For example, the optimized engine Auto Start Stop feature now turns the engine off earlier while coasting to a stop. With the exception of the Panamera GTS, models with PDK also offer a coasting function in which the clutches open in overrun allowing the engine to idle and the vehicle to coast freely. This function can significantly improve fuel economy, especially when traveling on the highway. Exterior design changes of the new Panamera are extensive. The tighter and more prominent lines up front are especially apparent in the larger air intakes and the transition to the headlights. Perhaps the most distinguishing feature of the new generation Panamera is a new trunk lid; its laterally stretched glass emphasizes the vehicle's width and makes for a more aggressive stance. Rear body proportions were also changed. A larger automatically deploying spoiler and a tighter transition to the rear lights complement the treatment at the front of the vehicle noted above. The new Panamera continues the tradition of multiple options that enable owners to customize the look and function of their vehicles. Full-LED headlights, which lend the new generation a striking appearance, are now an option. In addition, an expanded lineup of assistance systems is available for safety and convenience. The revised adaptive cruise control system is now offered with Porsche Active Safe (PAS). This system visually and audibly alerts the driver in the event of a sudden decrease in following distance and briefly tugs on the brakes. It can also intervene in the braking process and apply increased braking pressure in an emergency braking situation, if required. Another new feature, camera-based lane departure warning, offers greater convenience and safety in city and highway travel.